Breville VTT470 Impressions 4 Slice Toaster - White. Note: If you are only toasting 2 slices of bread then you must use the right hand carriage, for more than 2 slices you operate the right hand side then the left. 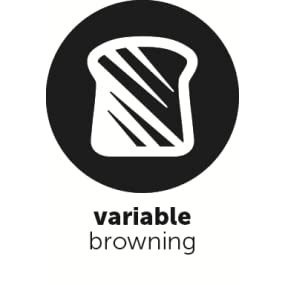 The Breville Impressions VTT470 4-Slice Toaster is convenient, powerful and complements your kitchen. 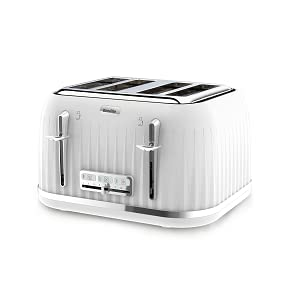 This 4 slice toaster is textured ridged walls and a satin chrome finish design. Full of handy features with high performance toaster. Why not complete the look in your kitchen with the matching Impressions VKJ738 Jug kettle? Other key features include defrost straight from freezer, a mid-cycle cancel button and a cool wall feature meaning there’s no chance anyone burning their toast or hands. With illuminating buttons you can see exactly which setting you’ve selected, ensuring those perfect toasty creations in your home. Also, toaster comes with a removable crumb tray for easy cleaning, ideal for a family home. With non-slip feet the toaster has no escape and will stay firmly in place even on wet surfaces making it a safe product to have in and around your kitchen. Last but by no means least; for when not in use the cord storage feature will keep your kitchen fuss free and looking tidy. Whether you like thin, thick, middles or crusts the Breville Impressions 4 Slice Toaster is sure to toast your loaf just how you like it. 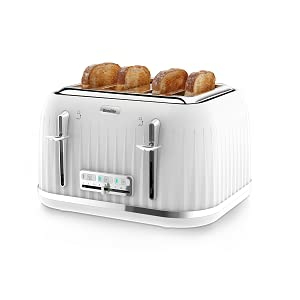 The four variable slots cater to a variety of bread sizes or even bagels meaning your breakfast, lunch or midnight snacks will never get stuck. This white has nine heat settings and a handy high lift setting helping you keep your fingers well away from the hot elements.